Tickets are on sale for our Parlor Show at Flourish Arts in Biddeford! Since 2008 Dark Follies has brought together performance artists and musicians to create unique and entertaining variety shows. With live music, dance, juggling, sideshow acts, comedy, fire and flow we seek to create an entertainment experience that brings delight to audiences of all ages. Dark Follies brings vaudeville to life on the street, the stage and the hearts of our audience. For information on private even booking please click HERE. 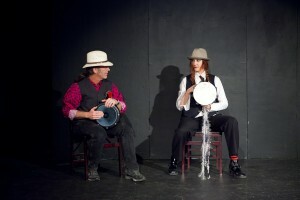 “Dark Follies brought Vaudeville back with style and pizzazz on April 22, 2011! If you were lucky enough to see the show, you know what I mean, if not be sure to make it to the next one! !” ~Darcy S.